Various exercises are associated with the practice of qigong. Such religious groups as the Falun Gong in China use qigong to manipulate qi energy for physical and spiritual benefits. Getty Images. The term qigong refers to a set of practices integrated into traditional Chinese exercise, meditation, and healing practices. The practices are tied together by the belief in qi (also known as chi or ki), the universal energy existing throughout the cosmos. In psychic circles, qi is usually identified with prana, spirit, and other names for cosmic energy. In traditional Chinese healing practices, such as acupuncture, qi is pictured as flowing through the body along a number of invisible channels called meridians. Disease is the result of blockages of the normal energy flow through the body. Qigong has both its esoteric side, known only to a few master practitioner-teachers, and a practical side, as demonstrated in the popular practices in which the public engaged. Qigong masters traditionally horded their knowledge and passed it on orally to a few successors. The role of qigong radically changed after the Chinese revolution. The Maoist government suppressed the Taoist and Buddhist centers and monasteries from which most qigong teachings were generated and oversaw the destruction of numerous qigong texts. As a result, some teachers fled to southeast Asia and the west, and some of the texts began to be published. 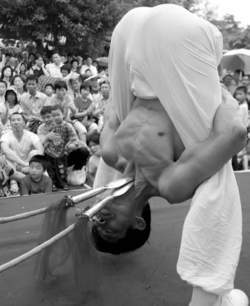 The height of suppression of traditional practices in China, viewed by many as superstitious practices, occurred during the decade of the cultural revolution that began in 1966. In the aftermath, Chinese leadership began a reevaluation of traditional culture, one result of which was the encouragement of qigong. A national association of qigong groups emerged and the practice flourished. At the same time, several teachers established themselves in the west. Qigong reemerged as a secular practice, though some connection to Taoism and Buddhism, which were also reemerging at the same time, continued. The teachings about qi as the underlying cause of qigong’s value helped the practice retain some of its religious connections. It also led to the appearance of parapsychologists in China who carried out a number of experiments attempting to scientifically verify the existence of qi. One effect of the reemergence of qigong was the founding of a number of new groups, which were more or less attached with the national qigong association, to perpetuate its practice. One such group, called Falun Gong, was founded in the 1990s by Master Li Hongzhi. It ties the practice to a variety of traditional Buddhist ideas, but as a total set of teachings it was a new religious movement in which qigong practice was an essential tool leading to enlightenment. Li left China in 1996 and now resides in the United States. Falun Gong claimed millions of practitioners inside China by the end of the 1990s. It also came under attack. It was independent of the national association and was advocating a new religious teaching independent of the state-approved China Buddhist Association at its temples. After a newspaper criticized Falun Gong on April 25, 1999, some 10,000 members engaged in a silent protest at Tiananmen Square in front of the government buildings in Beijing. This demonstration, which came as a surprise to government security forces, had a completely opposite effect than that desired by the organization. Rather than stopping the actions against it, Falun Gong became a major target of government suppression. The Chinese government moved to destroy the organization, and inside China it has largely succeeded in suppressing it. Numerous adherents were jailed and all public activity outlawed. The organization was declared an evil cult. By 1999 Falun Gong had nevertheless spread to a number of countries outside China, and adherents have organized an international campaign to call attention to the suppression of the movement inside China. It has negatively branded the government for violating human and religious rights, as well as for engaging in the torture and killing of its members. The Chinese government has retaliated by charging the movement with denying members proper medical care and thus causing the death of many people. While justifying its actions within China, the government’s charges have found little support outside the country. Hon, Sat Chuen. Taoist Qigong for Health and Vitality.A Complete Program of Movement, Meditation, and Healing Sounds. Boston: Shambhala, 2003. Hongzhi, Li. Zhuan Falun (Revolving the Law Wheel).Hong Kong: Falun Fo Fa Publishing Co., 1994. Jahnke, Roger. The Healing Promise of Qi: Creating Extraordinary Wellness through Qigong and Tai Chi.Chicago: Contemporary Books, 2002. Lee, Richard E. Scientific Investigations in Chinese Qigong. San Clemente, CA: China Healthways Institute, 1999. Wong, John, and William T. Liu. The Mystery of China’s Falun Gong: Its Rise and Its Sociological Implications. Singapore: World Scientific Publishing Co. and Singapore University Press, 1999. The Qi Gong program includes eight sessions with instructor Jose Antonio Anonas every Wednesday and Saturday, 10-11 am, fourth floor, Dance Studio of the Sunshine Place. Some of the benefits of engaging in Qi Gong prenatally include a reduction in anxiety among first time mothers (Jeong & Lee, 2006), a reduction in prenatal depression (Lee, Kim & Ahn, 2006; Ji & Han, 2010), decreased physical discomfort during pregnancy as well as a stronger postpartum maternal-infant interaction (Ji & Han, 2010). In Section 3, the database establishment of vectorized Qi Gong calligraphy is given. In pursuit of this argument, van der Veer addresses different understandings of art, compares yoga with qi gong, looks at concepts of secularism and of conversion within Christian histories, differentiates between constructions of religion in India and campaigns against superstition in China, and juxtaposes Muslim Kashmir and Muslim Xinjiang. Banging the qi gong TODAY is World Tai Chi and Qi Gong Day (WTCQD), celebrated annually on the last Saturday of April since 1999 to promote the related disciplines of tai chi and qi gong in more than 80 countries. With 17 years teaching experience, Kate personalised viniyoga, blending holistic teaching including hatha yoga, qi gong, shaolin arts, guided visualisations, movement therapy, relaxation and more. Advanced practice: Qi Gong for Long Life: Cleanse & Build Inner Qi. The ancient Chinese art of qi gong provides both in number of movements that can be easy for wheelchair users to do. Hatha yoga classes and Qi Gong are examples of other sources of inspiration. 998 O'Shea created the Qi Gong Institute of Rochester, in western New York. The six week course kicked off last week at The Deighton Centre for those aged between 14 and 25 to practice the art of Lishi which incorporates Tai Chi, Kung Fu and Qi Gong. The slow, meditative quality of tai chi and its close cousin, qi gong, suggest that very likely it leads to 'up-regulation' of the parasympathetic nervous system and reduction in sympathetic 'fight or flight' response, including reduction in blood pressure," she explains.